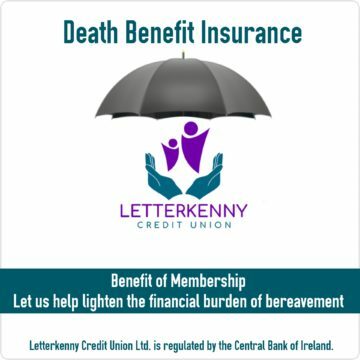 Information - Member Benefit - DBI - Letterkenny Credit Union Ltd.
Death Benefit Insurance – DBI – is an insurance provided by our Credit Union to help cover the costs of funeral expenses upon your demise. There is no direct cost to our members for this insurance. are actively at work, carrying out your normal duties, or otherwise in general good health. The sum of €1950 will be paid towards your funeral expenses for eligible members. This will ease the untimely financial burden on your loved ones. Should an accidental death occur the Death Benefit amount payable will be doubled. Terms and Conditions Apply. Click here to find out more information on Credit Union DBI.